Arizona death metal unit GATECREEPER has shared a new video for "Stronghold" off the 2016 released full-length Sonoran Depravation. The video features footage from the Peoples Temple Agricultural Project, better known as "Jonestown," on November 18th, 1978. Additionally, GATECREEPER will begin their European headlining tour in two weeks. The trek commences on September 8th in Finland and runs until September 22nd in Netherlands. Support will be provided by RATLORD on select dates. The band also is set to perform at HOCO Fest 2017 on August 31st and provide direct support for CANNIBAL CORPSE and POWER RTRIP in the US throughout November and December. 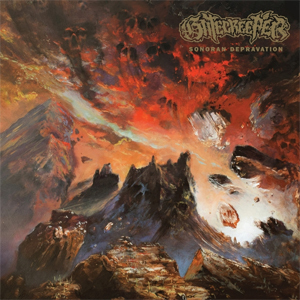 GATECREEPER's latest album Sonoran Depravation is out now on CD/LP/Digital via Relapse Records. Physical packages, including the album's fourth LP pressing, are available via Relpase.com and digital orders via Bandcamp. Stream GATECREEPER's live EP Unleashed In The Middle East now on Spotify and Apple Music.